Pick up a pound of juicy ripe pears and enjoy their sweet succulence eaten just as they are - but save a couple too for this fabulous frangipane tart from Waitrose Home Economist Lisa Abbey Keep pear recipes simple, like this wonderful tart, for great results. English pears cook well, although they should be firm so that they keep their shape. Frangipane is classically flavoured with ground almonds and used to top cakes and pastries. Use ground pistachios or pecans, if you prefer. Roll out the pastry and use to line a deep 23cm fluted flan tin. Chill for 30 minutes. Preheat the oven to 180°C, gas mark 4. Prick the pastry base with a fork, then line with greaseproof paper, fill with baking beans and cook in the oven for 15 minutes. Remove the beans and paper. Spread the greengage conserve over the part-baked pastry base, then top with the almond mixture, smoothing the surface with a palette knife. Slice the pear halves and fan out. Arrange on top of the filling. 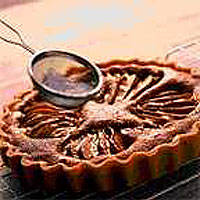 Return the tart to the oven for 35-45 minutes until the filling is set and golden brown. Brush a little extra conserve over the pears and filling while the tart is still warm. Dust with icing sugar and serve with crème fraîche.